Marco Rubio and Paul Ryan lead a Republican campaign against poverty. Marco Rubio and Paul Ryan lead a surprising Republican charge. Paul Ryan and other conservatives marked the 50th anniversary of the war on poverty by announcing their own ideas to provide relief to the poor this week. Lyndon Baines Johnson was staring Marco Rubio in the face. It had been, as Rubio reminded his audience, 50 years since “President Lyndon Johnson sought to address the plight of poverty by waging a war against it.” Rubio, who can’t (yet) call a joint session of Congress to share his big ideas, was speaking in the Senate meeting room that once served as Johnson’s office, long since restored to its Victorian beauty and host to weekly Republican luncheons. A tastefully small portrait of Johnson hung on the wall above and behind the cameras—i.e., right where Rubio had fixed his eyes. Fundamental, sure, but Rubio couldn’t call it “new.” In 1975, when the future senator was 4 years old, Ronald Reagan delivered a speech that called for a “creative federalism” to replace all anti-poverty programs, “a systematic transfer of authority and resources to the states.” None of the conservative wonks in the small room seemed particularly startled by Rubio’s idea—not National Affairs editor Yuval Levin, not American Enterprise Institute President Arthur Brooks, not columnist (and Jeopardy! winner) James Pethokoukis. The oldness of the idea was part of the sale. Rubio’s speech came during a surge of Republican big-thinks on the subject timed to the anniversary of Johnson’s “War on Poverty.” Reporter Byron York, whose understanding of conservative and GOP strategy borders on the telepathic, called this surge “a campaign launched without the party’s internal agreement on a specific anti-poverty agenda,” a distraction from the quest to win middle-class votes. Yet Eric Cantor went ahead and talked up school vouchers. Paul Ryan continued an anti-poverty speaking tour that has yet to delve into policy or cost. Even the Republican Study Committee, the conservative group whose membership helped shut down the government, held a brief declasse-centric event on the LBJ anniversary. True, the House GOP ended the week by returning to the safe harbor of anti-Obamacare legislation, but for a few days Republicans really did want to talk about poverty. The media noticed. Coverage of the poverty speeches fit into two categories—mile-high analysis of the electoral politics, and chin-wagging about what the Republicans were actually proposing. “A lot of voters felt that President Obama cared more about them than Mitt Romney did,” sighed Maine Sen. Susan Collins (who missed the party by not giving a major speech this week) to the New York Times. That was true. According to the 2012 exit poll, voters said that Barack Obama was more “in touch with people like them” by a 10-point margin, and when asked which candidate “cares about people,” 81 percent chose the guy who didn’t work at Bain Capital. Only 71 percent of Hispanic voters—you know, the last constituency that Rubio and Ryan told Republicans they needed to win over—voted for Obama. Never mind that, because hearing Republicans talk about poverty as a problem the government can fix by distributing money is much more radical than anything they’ve said about immigration. From the start of the stimulus through the 2012 election—through the age of austerity politics, basically—the party was vehemently against redistribution. Before he lost, when they still had to defend him, Republicans agreed with Mitt Romney about “the 47 percent.” Pay no net income taxes and you’ll become a moocher, as sure as a caterpillar turns into a moth. Jon Huntsman, supposedly the “moderate” Republican candidate (it helped if you never read his tax plan), worried that “we don’t have enough people paying taxes in this country.” Who did he credit with that insight? A promising freshman senator named Marco Rubio. I tried to attend all of this week’s poverty-o-ramas in person, and I heard a completely different melody coming from the GOP. Most of the time. Excising Cantor, who was really continuing a series of small-scale reform speeches that he’s given since 2012, here’s what everyone said and how new it was. Pronouncement that the War on Poverty failed: Check. Rubio tut-tutted LBJ for “the belief still held by liberals to this very day: that government spending is the central answer to healing the wounds of poverty.” Every Republican poverty speech needs to insist that the spending failed and was doomed to fail. That’s how you can make a speech about poverty while urging states to avoid Medicaid expansion. Details: There’s your problem. That one specific question for Rubio, about what might be included in the Flex Fund, got him to say that it was being “worked out.” Rubio referred to a war on poverty that had spent “trillions,” which implies some spending—Medicare, say—that wouldn’t make it into the fund. A revenue version of the tax credit would, as Jonathan Cohn discovered, probably reward poor, childless people, though Rubio called marriage “the greatest tool to lift children and families from poverty.” Legislation is not yet ready. Setting: A 15-minute interview at the Newseum in downtown Washington, conducted by Brian Williams. The cheerful host wasted nearly 1/15 of this time discussing football. Battle scars from seeing poverty up close: Several anecdotes about Anacostia, the poor D.C. neighborhoods “just seven miles from here,” where Ryan had met a heroic bishop who cleaned up a dangerous housing project. Ideas: Housing vouchers. “We’ve got to stop quarantining the poor,” explained Ryan; Republicans should try to move people closer to where they work. 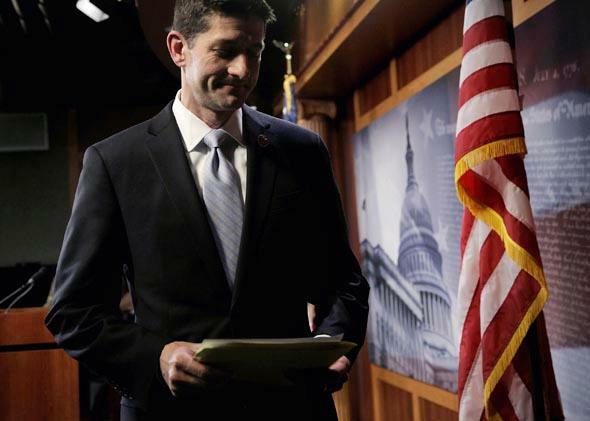 Ryan’s version of the Flex Fund was borrowed from the U.K.’s ruling coalition government. “They have a new idea called the universal credit,” he said. “They took six means programs, consolidated it into a credit.” That is a new idea, but its arrival has been flummoxed by design delays and cost overruns, something Republicans are decidedly against when it comes to big new government programs. Details: Still to come. Ryan, whose anti-poverty ruminations have been profiled by reporters for at least the last six months, is expected to come out with legislation by March or so. Setting: One of the Capitol’s TV studios. Not particularly evocative, but pretty nice carpeting. Details: Again, see those bills they’ve already been trying to pass; see, too, what private charity can do when not hidebound by bureaucracy. The Republican Study Committee has actually been on the poverty-campaign trail since September 2012, when it launched an “initiative” to generate ideas. That launch included community organizers like Bob Woodson, founder of the Center for Neighborhood Enterprise, who’d been optimistic about what a little fresh thinking might do. Woodson was back on the Hill this week, among the audience at Rubio’s speech, hoping that this time might be different.